Let’s talk about performance reviews. They’re a hotly contested topic amongst managers, employees, and executives alike—and it’s up to Learning & Development (L&D) and HR professionals to make them successful. Unfortunately, today’s performance review is widely unpopular. But the performance review is important. It offers opportunity for impactful dialogue to advance employee careers and strengthen employee manager relationships. The performance appraisal plays a critical role in standardizing reward and promotion decisions, while encouraging employees to learn and grow. The performance review just needs a shift to address the modern workforce. It’s time to make the shift in performance management from an antiquated one-time-per-year conversation focused on outcomes, to the continuous discussion around performance and growth that employees crave. Performance reviews don’t need to be something employees dread. Use these 6 tips to make the shift toward a system that will continuously support and grow your talent. The golden rule of performance evaluations is, avoid the shock factor. Employees should have a good idea of what will be discussed before they walk into their review. On the flip side, consistent feedback helps managers gather more data, increase employee engagement, and drive business outcomes. Ensure that managers across your organization have regularly scheduled touch-points with employees. This is usually a combination of weekly 1:1 meetings with managers, quarterly reviews, bi-yearly written reviews, and of course, the once-per-year formal review. Effective performance management evaluates employee contributions holistically. Google asks managers to measure employee performance beyond outcomes—they want to look at how the employee achieved those outcomes. They look at the employee’s ability to demonstrate company values, problem solve, execute with little guidance, and make himself or herself heard in an increasingly large organization. Effective performance appraisals encourage employees to explore their career trajectory. Not all employees will approach the subject of career growth. The organizations that encourage managers to discuss career paths regularly with employees will retain star contributors they grow into managers and leaders themselves. Managers are the key to impactful performance evaluations. Help your managers master critical feedback and compensation conversations. As an L&D leader you should feel most powerful here—you have the ability to create and curate resources to help managers thrive. 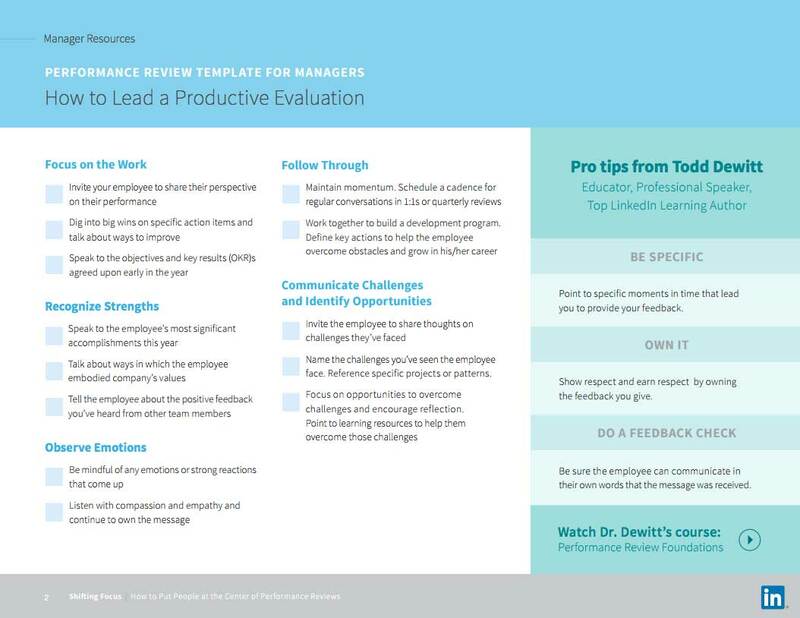 Provide training on how to run a meaningful annual review (like this performance review template for managers!). Arm managers with the inputs they need—like learning resources, career ladders, feedback they’ve gotten from peers, compensation matrixes specific to your organization. Perhaps most importantly you need to help managers give clear, honest and constructive feedback. Having conversations around performance and compensation is hard—especially if the manager needs to provide negative feedback. Research shows that managers consider giving negative feedback one of the most difficult and stressful interactions in the workplace. Clearly defined, measurable goals must be a central tenet of performance management. If you’re not already, have managers document individual and team goals for the quarter and the year. Annual goals should be more aspirational (e.g. sign 1,000 customers) than quarterly milestones which should be more granular and should explain how you’ll get there (e.g. drive 1,000 quality leads to build pipeline to close 1,000 customers). Many organizations look to goal setting frameworks like SMART goals and Objectives and Key Results (OKRs) to drive consistent goal setting across the organization. Set learning goals as part of your quarterly metrics. Identify and document a learning plan based on places the manager and employee see room for improvement. This could be reading a few articles per week on the subject, interviewing colleagues, watching courses on an eLearning platform, or attending a classroom training. The manager and employee should meet regularly to discuss progress on learning goals, improvement milestones, and employee learning’s connection to overall performance. Companies like LinkedIn, Google, Walmart and Target have turned to OKRs to measure employee goals. I will ____ as measured by _____. I will (Objective) as measured by (Key Results). Objectives are usually qualitative goals (e.g. increased brand recognition). Provide the tools and technology your managers need to collect data, and communicate and learn about the performance review process. Provide a central hub for information: Managers are busy. Provide one central place where managers can find what they need to learn about the review process, document feedback, and stay on schedule. If managers need to put too much effort into finding what to do, they likely won’t do it—or won’t do it the way you want them to. Collect and document employee performance: Employee reviews should be a year-long process. Provide managers with the tools they need to formally document employee feedback—scheduled or unscheduled. For example, GE implemented an app that allows employees to request feedback from managers. It provides summaries of employee goals and any notes that managers or employees have around those goals. While you may not have an app dedicated to your performance management, there are tools like Workday that can help you document employee feedback. Gain access to expert learnings: Point managers to eLearning platforms like LinkedIn Learning to help them gain confidence at review time and as a resource to recommend to employees to support their development in key areas discussed in the review. Invest in a communications plan to get your managers and employees psyched up and focused on performance reviews. get creative. Think about the different communication mediums available. Email marketing, physical desk drops, posters, bulletins on monitors throughout the office, all-hands meetings, external speaker events, a pancake breakfast—these are all fair game. Leverage your internal infuencers and partners. HR business partners should be at the top of your list. For each company-wide communication you send, have your HR business partners follow up with a more personal note to the teams they work with. Get managers’ attention and buy-in by sending emails from your executive team. Performance management is a central tenet of talent development. While the one-time-per-year performance review is becoming a relic of the past, we’re seeing a surge of real-time regular performance feedback about more than just metrics. The modern performance review is about the employee, himself or herself—not just outcomes. Use resources like these to help your performance management shift toward a system that continuously grows and supports your talent. Your managers and employees will thank you for it. LinkedIn Learning is the only learning platform designed to meet the needs of modern learners and the demands of modern business. Combining Lynda.com’s industry-leading library of expert-led and loved courses with unique LinkedIn insights from over 500 million professionals, LinkedIn Learning makes it easier to get the right content to the right learners at the right time, and help your people engage, learn, and succeed within your organization. In fact, 63% of professionals were able to apply what they learned from LinkedIn Learning within one week.